Attachment is the identification with anything conceptual. You gain a sense of complete self with anything regarding thought. Take for example Jerry. Jerry grew up in the slums of Los Angeles his whole life. He was always surrounded around gangs, cracks in the walls and ceilings of his home. He couldn’t afford to clean his clothes so they were constantly reeking and also had holes in them. At 6’3 he never weighted more than 150 pounds because he could not afford to eat very often. As a result Jerry had no confidence in how he viewed himself as a person. This lead to anxiety with women, when it came to getting a job and going to school. His sense of ‘self’ was very low. Then one day a grandfather that he had never meant had past away and was very wealthy. Jerry inherited his grandfathers will of $50,000,000. As you can imagine Jerry was instantly ecstatic that his life situation would soon be turned on it’s head. Jerry bought a mansion in the downtown suburbs of Los Angeles. He then proceeded to buy a private jet, a Bugatti, a large boat and hired a maid. Jerry went directly to downtown Los Angeles found a professional fashion designer, bought lots of very expensive clothes. His confidence sky rocketed and landed himself a model wife. In Jerry’s mind he finally felt enough. The luxurious house, cars, jet, boat and wife all gave him a sense of completion of ‘self’. However, as time passed he quickly got into a deep state of depression.That doesn’t seem very logical now does it? He went directly from the slums into a luxurious life overnight. What happened next was Jerry still felt like he didn’t deserve this stuff, that he felt like a fake someone who could have never achieved such a lifestyle on his own. He also began to have nightmares about losing such a lifestyle and going back to his old slum like lifestyle. What happened was he attached his sense of who he was as a person in totality with his situations, circumstances, materials and people. 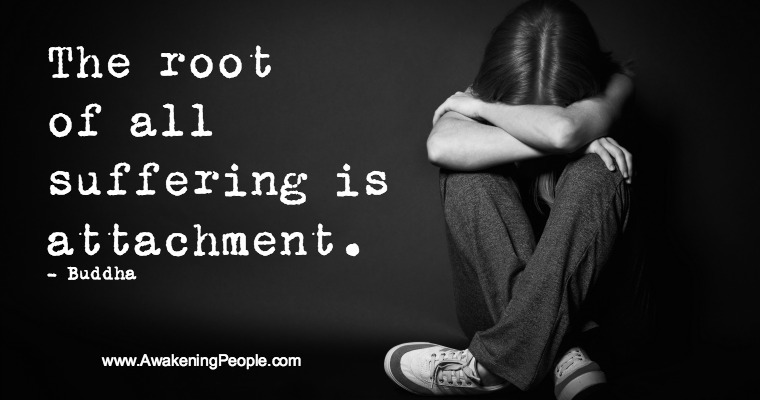 The root of attachment boils down to how secure someone is as a person, also known as self esteem. Every individual on this planet has a different dimension of self-esteem. Everyone has their individual strengths, weaknesses, confidence and insecurities. However, when your on the journey of awakening, the journey of truth the awareness of who and what you are goes well beyond the thinking-world. In many religious/spiritual traditions the true ‘I’ the true self is formless. Anything that takes any kind of form is not the totality of who you are in the deepest sense. Jerry’s life had been split up into two concepts. One where he was poor, and one where he was rich. In both lifestyles who was at the deepest core never changed, and will never change regardless of what happens here on earth. When you take a step back from thinking and go to your heart with awareness you really begin to see the root causes of your suffering. When thought arises it takes form, a form of neurosis. As said previously who you are is formless, so if thought is takes form than how can it be who you really are? Ego is the ultimate root of suffering as it’s main priority is to trick you into believing who you are, and false belief that ultimate truth is based on thought. In order so ego may fully take over and put your body on strings into full puppet mode, it must expand and so it creates desire. Desire is to expand the ‘sense’ of self into more. To get more, to achieve more because ‘I’ want to be enough. Desire is the need for the void to be filled, by gaining whatever the thought so desires. A thought consists of a mental concept. The cycle of desire comes back to one of the main obstacles of humanity and that is fear with a lack of awareness. When you achieve everything you originally ‘desired’ that it made you feel great for a moment, but as time passes you lost the fulfillment you once had. Ego has done his job and emotional pain has occurred. Think back to the situation Jerry was in, first he was poor then rich, but see how he got everything materially he had always dreamt of yet it did not ultimately fulfill him. How can you achieve things, become attached to them, if you are not in an emotional state of loss? With mindfulness, gratitude and detachment, you can less the pain. Mindful awareness is recognizing EVERYTHING in your life and asking yourself “Who would I be without such and such?” Detachment is recognizing that certain concepts have a grip on your identity and just loosening the grip before you don’t need them completely. Gratitude is enjoying the things in your life, appreciating them but awareness realizing they don’t make you or break you. What about attachment to things such as food, water and shelter? These are absolutely necessary to survive on this planet, but again they don’t make you who you are in the same sense. It is man’s human instinct to desire survival. Food, water and shelter are necessary desires, as long as we don’t become attached to them as a way of making us for even after death the ‘you’ transforms into a new life form.